Happy New Year and Happy Valentine's Day bloggieland! Here's a free Valentine's word find printable for the kids! New in the shop! Stu the Penguin Doll and Fun pack. need during last minute gift wrapping. Happy Holidays everyone, see you next year! Sorry to recycle an old post, but this project is always popular this time of year so I thought I'd re-post for those who might have missed it. If you're looking for a quick and inexpensive gift that you and can make and give in multiples - how about an Advent Calendar made from packs of gum! Hi there! I've been super busy and don't have anything new to post but here's some crafts, recipes and tutorials from the past that may come in handy in the next couple of weeks. Happy Holidays! Buddy taught me how to make these mini books years ago after he made one in his writing class in school. It's brilliantly simple and creates a six page book (plus cover and back) with a single sheet of paper and no glue or binding. I made this bunny version for Buddy and thought I'd share a tutorial and PDF file so you can make one too. PDF file and instructions after the jump. Happy early Valentine's Day! Here's a valentine coloring page I made last night while playing with Microsoft Word. It was pretty easy to draw using the ready made shapes until I got to the arms and legs and then I had to get creative, can you spot the three hidden hearts? (I changed my mind and re-did the limbs). Anyway, if you're looking for something to keep the kids busy this week you can print out the PDF version here. You might have guessed from my pocket advent calendar post that we like to keep our breath fresh around here and so we end up with a lot of empty mint containers that I just don't have the heart to throw away. But I finally came up with a use for them - snow globe pendant necklaces! I can't decide whether to make these for the kids or do it as a Christmas craft with them because they were really easy to make. In case you want to make some too here's a little tutorial for how I did them. One thing that happened during my bloggie absence was the publication of this book in September by Penguin Australia. Some of you may remember the wonderful Softies book from last year which I contributed two patterns for. Penguin Group has once again done an amazing job putting this beautifully photographed book together featuring 22 new creations from many of the same crafters and designers from the previous edition. I'm beyond excited to once again be a part of it! They've has also created a website just for the two books which features an exclusive pattern, and wallpapers to download including my little pup shown above. Fun! 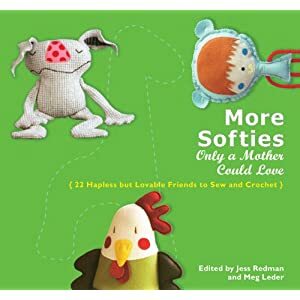 Updated: The American version of More Softies was released in February 2010 under the title "More Softies Only a Mother Could Love: 22 New Friends to Sew and Crochet" you can buy it from Amazon here.